This review has been long overdue. Granted I created Chicago Alphabet Soup for review of restaurants in the metropolitan Chicago area, I am a bit of an international-phile. 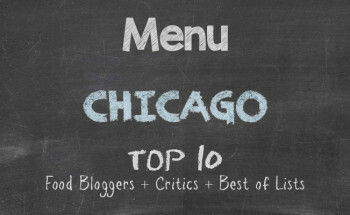 Chicago is tops in the restaurant area, and certainly when it comes to a variety of ethnic eateries. But with travel, I often get a chance to sample bites while visiting other parts of the world. Towards the latter part of 2010, I had mentioned that I had taken a personal holiday abroad in Australia. During my brief stint Down Under, I promised a friend that I would journal at least one restaurant I had found fascinating enough to blog. I spent a little over a week in Melbourne sampling more than my fair share of cafes, restaurants, diners, and outdoor shops. As fascinated as I am with the multitude of options that Chicago offers, Melbourne is a Wonderland of delights for the palate. Restaurants seemingly go on for miles in any direction. 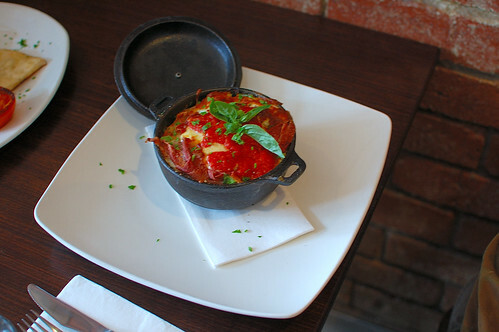 But one restaurant that stood out was a particular rustic Italian cafe in Brunswick, which is the neighbouring suburb just north of Melbourne. So very reminiscent of the Wicker Park section of Chicago and highly recommended by my friends, I got to see an Italian chef works his magic Australian style. The two friends I visited in Melbourne had mentioned that they have a Sunday ritual. 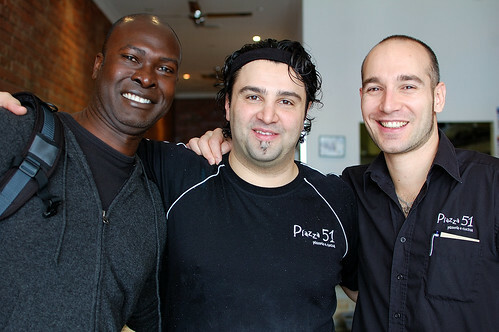 For breakfast, they frequent a restaurant called Piazza 51, which is located at 51 Sydney Road in Brunswick. 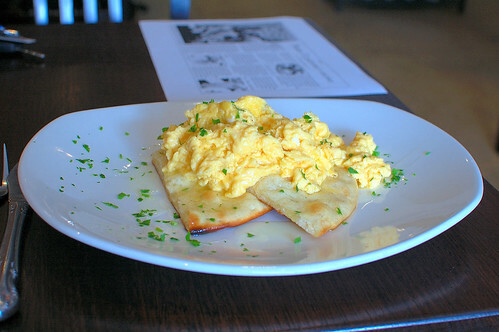 Being that I am a regular at a certain eclectic organic breakfast spot in Chicago, I understood. My friends would then go about their day, enjoying the sites and sounds of Melbourne and the countryside, and then they would return home to freshen up before going back to Piazza 51 for dinner. Hmm. That is what I call dedication more than a ritual. And for the Sunday that I was in the city visiting, the last thing I was going to do was complain about food, my lover, my constant comfort, my reason for fighting with widening in the middle. 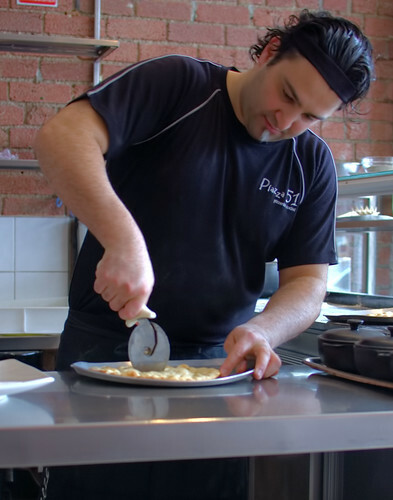 Piazza 51 employs use of a wood burning oven and with the kitchen being right there with you, practically, you get to see the chef in action. Very nice, I thought, since you get to see real ingredients go into your food. 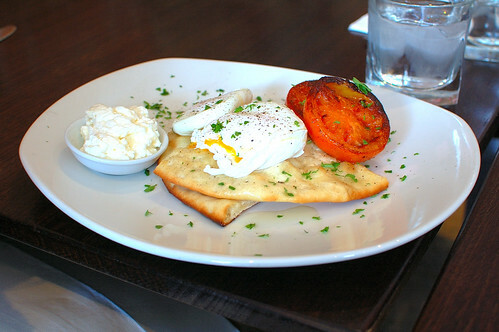 For breakfast, my friends and I feasted ourselves on focaccia under scrambled eggs, focaccia with poached eggs and tomato and ricotta cheese, and a baked egg with sausage and vegetables in a clay pot. Here is where I would usually insert a smart remark like “oink,” but a bit of my British leaning was intact, so there was plenty of pomp about my feast and appreciation — in my mind I was having a moment, to put it mildly. But not to see such a pleasure on plates and not capture the moment, I snapped a few pictures while at my seat and also in the kitchen. Not only did the breakfast look like a presentation, but you could smell the goodness. That was probably because of fresh ingredients being used. Mainly it was because of my blooming appetite. This was filling enough that my stomach did not grumble for several hours. It was then that I understood why my friends were not so anxious to start gobbling something at any eatery immediately afterwards. After a day of touring the wine country, sampling wine, and making purchases, we returned back to Melbourne in time to get ready for dinner. Food, glorious food. My friends had commented that it was better to arrive at Piazza 51 early because the cafe tends to pack out early. I had figured that if the dinner was as good as the breakfast was, then it was understandable that the place would be filled to capacity for the dinner set. For dinner, hell yes, it was worthy of the return trip. 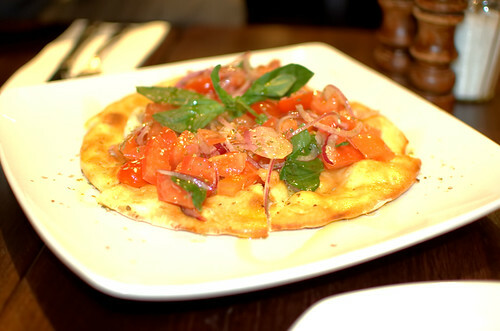 We started with a bruschetta on focaccia. 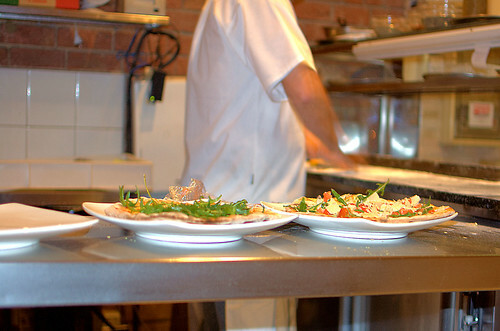 Again, fresh ingredients and focaccia baked to perfection in the wood burning oven. One of my friends ordered a vegetarian flatbread pizza with chillies on it. She is a danger girl. The other friend ordered a pizza full of vegetables and sausages. His eyes were dreamy after he had downed a fourth of the pizza. I ordered a flatbread pizza with thin potatoes and onion, and I have no earthly idea how I managed to get the whole thing down my cake hole. 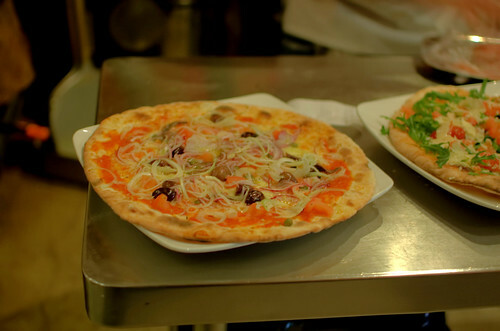 The pizzas all came on tremendous sized plates and still hung over the sides. On top of that, I had a sambuca that would do just great for a common cold. And in the spirit of gluttony, I had a molten chocolate cake with another shot of sambuca. Nice. It was quite refreshing being able to engage the chef and the other wait staff in conversation. That was, of course, one of the benefits of going with my friends who are regulars at Piazza 51. 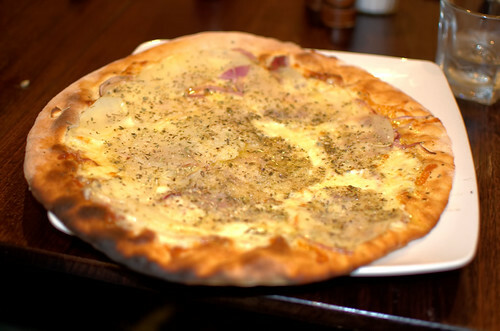 Not that they should consider opening a spot in Chicago, which would not be a bad idea, but the wood oven concept being used to retain a bit of the old country style of cooking is a selling point that makes Piazza 51 tops, much like the authentic Italian restaurants in Chicago proper. It is a welcoming experience to walk into an establishment and for the merchant and customer to have a first-name basis relationship. I now see why my friends wanted me to get the Piazza 51 treatment before dashing back to my very own world here on the the other side of the Date Line. While I must admit that Australia is a hot bed of scenic views, confusing dispositions, people who make no eye contact — unless staring at you sideways, and weird airs until your foreign accent is heard, I never went without an appetizing meal. That is a plus. If I were to do something like a restaurant show, I honestly believe that I could spend a whole season roaming through eateries in Melbourne and still have enough coverage of other restaurants in the city to fill up a few more seasons. Piazza 51 certainly got flagged as a restaurant I would include on the tour list. If you should find yourself making the rounds across the continents and Melbourne is on your itinerary, make your way on up to Brunswick and see how rustic Italian dining is done to satisfaction. Pip, pip.